Fire projects has expertise in SITC of GST102/4 conventional fire control panels provide two/four zones of fire detection. All panels have been designed to offer high standards of performance, reliability and quantity and comply fully with BS5839, Part 4, 1988 and EN 54 parts 2 and 4. Each zone can be connected with 15 conventional fire detectors. The GST102/104 conventional control panels are multi-wire alarm developed from SCM and with signal output interface board has passive nnormally open alarm output contacts and fault output contact on each zone. They have two external control output points to control some devices such as sounder, sounder strobe or bells. Fire Projects supply GST102/104 which is designed with internal standby battery connection and housing. 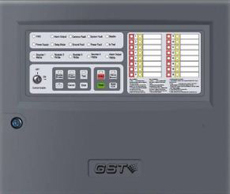 GST102/104 fire alarm control panel has multiple functions like isolation and test, setting day/night mode, indication of normal state, fault state, alarm state, short and open circuit alarm and identifying the location of detector zone. All control function are realized through a key switch and programming function realized through a key switch and DIP switch. The GST conventional panels includes an advanced range of facilities which make GST 102/4 as an Ideal panel for both standalone solutions, or integrated to larger systems in applications such as, shopping Canters and industrial complexes. We support clients for Designing up to Commissioning to installation to AMC of GST102/104 Conventional fire alarm control panel. We also provide AMC–Annual Maintenance Contracts for all types of Fire & security Systems. If you required new installation or AMC of fire alarm system, contact Fire Projects today! • Both end of line resistors and active end of line can be used.